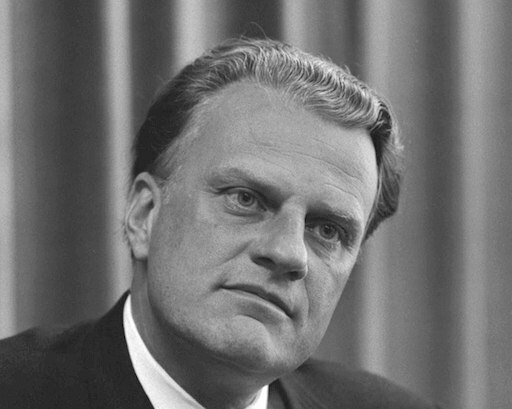 Billy Graham, the famous Protestant evangelist, died yesterday at the age of 99. Graham, of course, is one of the best-known and beloved Americans of the 20th century. He met with every President since Truman, and his evangelistic crusades led millions of people to commit their lives to Christ. By all accounts, he was a sincere Christian and a devoted family man. I found this tweet problematic for a Catholic, especially a Catholic priest. If you are Catholic, then you believe (or should believe) what the Church teaches. And the Church teaches that the sacraments are the best instruments of grace we have, and that the Church is necessary for salvation. Now Rev. Graham was a baptized Christian, so he was a member of the Church, albeit imperfectly. And his Protestantism was not a choice he made against the Catholic Church, but instead something he was simply born into. So I’m not saying that Rev. Graham is going to hell. However, as a Protestant who never was Confirmed, never received the Eucharist, and never went to Confession, he missed out on immeasurable graces that would have brought him closer to Christ in this life. Because of this, it’s far more likely that Rev. Graham will spend at least some time in purgatory, contrary to what Fr. Morris implied in his tweet. If a Protestant can go immediately to heaven—even a Protestant as commendable as Rev. Graham—then what is the purpose of being Catholic? For it would appear that simply being a “good Christian” is good enough to bypass purgatory. To me, this seems like a works-based religion. For it means that if someone works hard enough at being a Christian, then the graces found in the sacraments are unnecessary. Billy Graham was a great man, and a commendable Christian. We have reason to hope that he will one day be welcomed into the New Jerusalem by Our Lord. However, for his sake, please pray for him instead of canonizing him, for, like most of us, he likely will need to spend time in purgatory before entering his heavenly reward. I’m sure that our prayers, rather than our praises, is what he most wants right now. I’ve been waiting for someone to say this. Whew! Highlander! I understand the Protestant distinctions you proclaim as superior to Catholicism. I even understand dismissive agnostic and atheistic views on the Catholic church. I have moved through a faith journey that includes all of these views. Today I am Catholic. You have touched on several topics that would be fun to dialogue with you about in friendlier circumstances: purgatory, sacraments, Christ’s atonement…and more. I understand your love of Billy Graham. I have a long list of Protestant heroes I came to know as I moved along in my faith life. In terms a Protestant accepts, Rev. Graham and many other protestants are worthy of “sainthood” as you present it. They were holy people who loved Christ and set their lamp on the hill to draw others to Him. Unfortunately, your concluding two sentences are as un-Christlike as I can imagine. Are there sinners in the Catholic church? Of course…as there are sinners in every church. Can we disagree on doctrines? Of course…and we can dialogue on doctrine under suitable circumstances. But…can we ignore love? Absolutely not. Love from the Father is the love that Christ proclaimed on earth. You have missed the whole point of Billy Graham’s ministry…the reason for Christ’s life…and the gospel we are all called to proclaim.